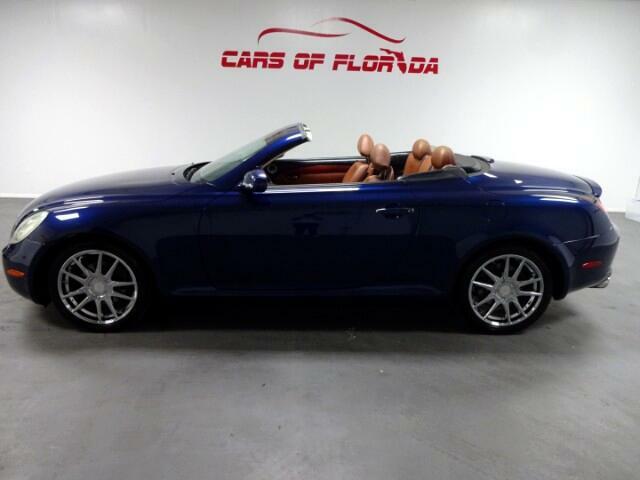 Cars of Florida is proud to announce this TWO owner Clean Carfax 2002 Lexus SC430 with 126k miles. This vehicle has exceptional service history and was well maintained. Local trade in and elderly driven. Everything works, needs nothing. Mark Levinson Surround Sound, Gorgeous Lexus Factory Paint and much more. This gem features a full Navigation, Keyless Entry, Two Remote Fobs, all books and manuals and aftermarket rims. Hurry in this will go quick! This Lexus is the definition of a late model Hard Top convertible unicorn! Powerful V8 produces resilient acceleration. Break necks as you drive around town in this Lexus SC430! Car is showroom ready and ready for frontline delivery! We offer competitive financing options on approved credit and extended warranty options to preserve the life of your Lexus for generations to come! We have sold thousands of similar vehicles between our Hillsborough and Pinellas County location! Customer Service is our top priority! If it does not meet our standards, it does not get featured in our inventory! Read our reviews and trust our brand. We are committed to becoming Tampa's largest independent dealer.